Or at the very least, putting on a funny hat and posing for photos. But how are you planning to celebrate? 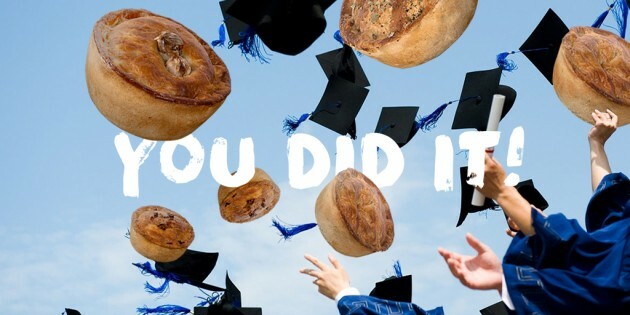 Here at Pieminister, we like to raise a glass to the big achievements in life, and so if you visit us on graduation day we will offer you a complimentary glass of prosecco with every main meal. Whether you opt for the summer special, Hurrikane, the British beef Moo or the vegan Kevin, just flash your gown in any of our restaurants* and you can be celebrating in style. Well done, clever clogs, let’s raise a free glass to you. *Restaurants include Bristol Broad Quay, Birmingham, Brixton, Cardiff, Leeds, Liverpool, Nottingham, Sheffield. Terms & Conditions. This offer is only valid on graduation ceremony days and there must at least one graduate (in cap & gown) per table. To receive a free glass of prosecco you must order a pie or skillet from the menu. Offer is valid to eat in only and to over 18s only. Offer applicable in our Pieminister Restaurants in Birmingham, Bristol (Broad Quay), Bristol (Stokes Croft), Cardiff, Leeds, Liverpool, Nottingham and Sheffield.